She is a bright student, lovely young girl and a wonderful dancer, she is Parnavi Kherade! 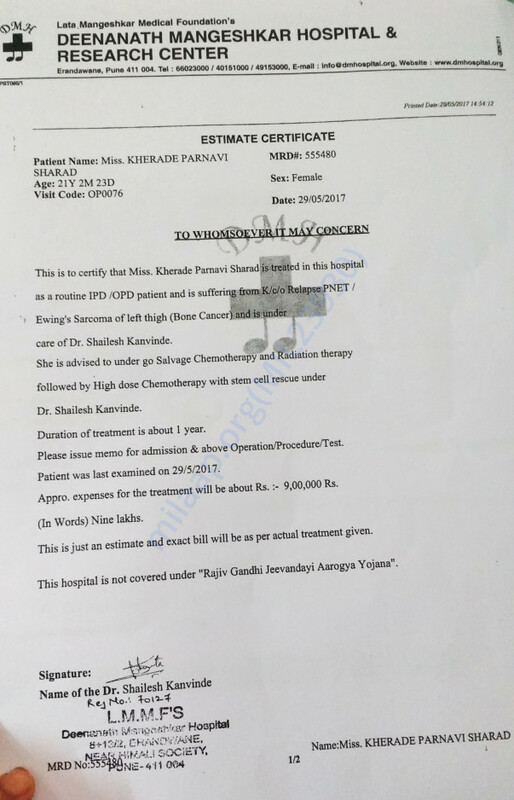 Pune based 21 year old student of psychology is fighting with bone cancer for 3rd time and she needs your help for her treatment. Parnavi is suffering from Ewings Sarcoma Left Femur (bone cancer in left thigh). 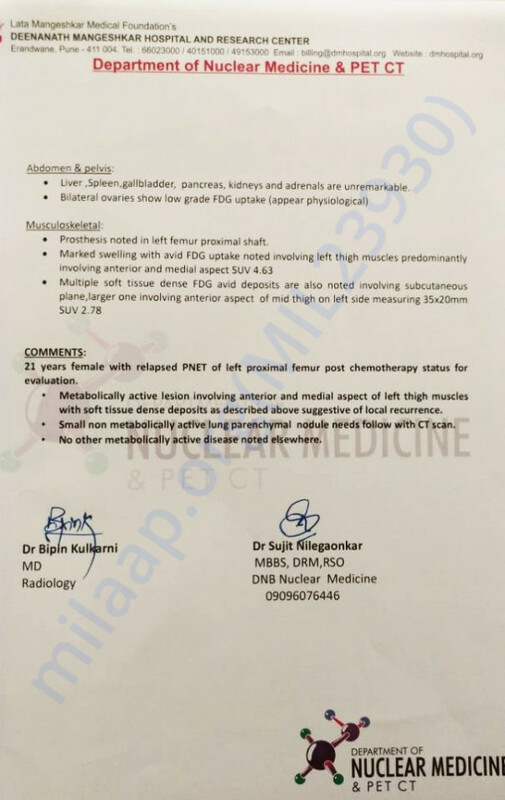 She has been advised to undergo Salvage Chemotherapy and Radiation Therapy followed by High dose Chemotherapy with stem cell rescue for 1 year at Deenanath Mangeshkar Hospital in Pune. Approximately it will cost her Rs. 9 Lacs. Her cancer has relapsed 3rd time now after going through Chemotherapy, Radiation Therapy and Surgery twice before. Parnavi was born in 1996 to Mrs. Archana Kherade and Mr. Sharad Kherade. Her father passed away just after a year in 1997 due to massive cardiac arrest. Her mother Archana is a single parent working at a private company in Pune on humble salary. After her husband’s premature demise, she was left to fend for herself without any family support, leave alone any inheritance. 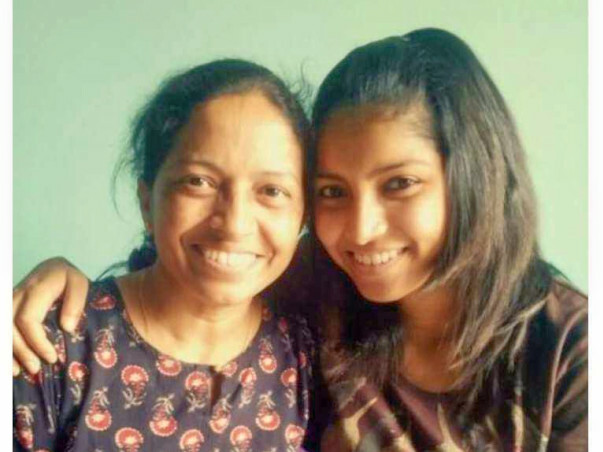 The spirited woman vowed to give the best to her daughter and worked hard at whatever job she could land, to give her daughter a good education. Parnavi completed her schooling from St. Joseph's high school and higher secondary from Symbiosis College. She is currently pursuing BA in Psychology from Pune. Despite all odds and sufferings she has gone through, she shows tremendous courage to follow her dreams. In mid-2013, Parnavi, she started experiencing acute pain in her left thigh, which just wouldn’t go. 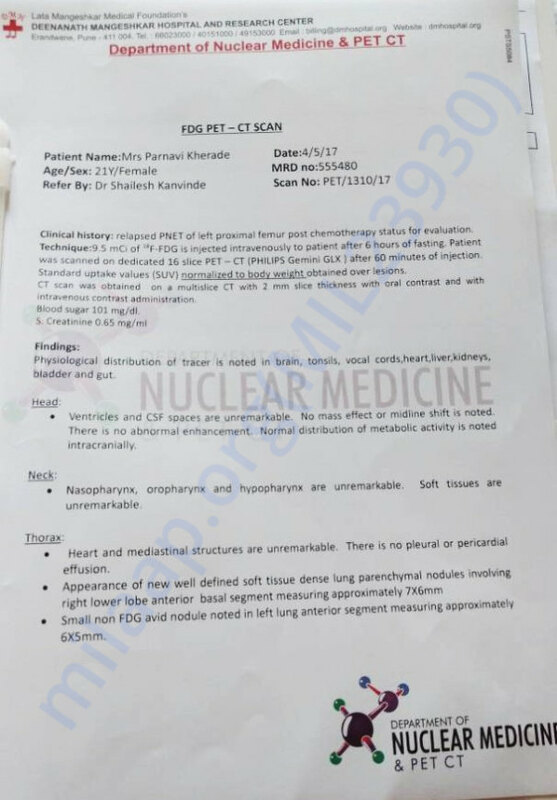 After usual treatment with pain killers and muscle relaxers, she was eventually diagnosed with cancer of the Femur, the most important thigh bone. Following was a series of diagnostic tests, biopsy rounds and a bunch of chemotherapy sessions,which increasingly sapped her energy. Her hands would frequently tremble due to the medication and she could barely grip a pencil. She might not have been able to stand on her feet again but chemotherapies, exercises and physiotherapy slowly got her to be able to get on to her feet. Twice before she was treated under Dr. Shailesh Kanvinde (Pediatric Haematologist and Oncologist) at Tata Memorial Hospital. Number of chemotherapies, radiation therapies and surgeries have costed them above Rs. 5Lacs till now. But now, when her cancer relapsed for third time, hospital expenses are shot up like never before. Her treatment now will cost approximately Rs. 9Lacs. It's impossible for her mother to raise this huge amount of sum alone, hence she needs support from everyone. Our small contribution can get Parnavi back on her feet. Her cancer is fully treatable. Let's contribute towards her well-being. Being in a family relation with her, I understand the fact that the estimate of her treatment is far beyond her family's reach. Hence, I humbly request you to contribute whatever possible. However small the donation is, it's still useful. Please contribute with donations towards her treatment. If you can get us in touch with any Government Body, NGO, Non-profit foundations who can help raising funds for this cause, please do so. Thank you for your love and support. We will forever be indebted to you. Parnavi is currently doing better. She is recovering and is on medication now. She is yet start her course of physiotherapy. It is likely to start soon. She recently underwent a PET Scan and other tests to check her status of health and fortunately, everything came out normal. Although her counts are yet to rise, the doctors have told us that it'll take some time for her to return to normalcy, probably around six months. She is supposed to visit the doctor once every week for a check up. Thank you everyone for being so supportive. It gives me immense pleasure in informing you all that Parnavi is currently recovering. The treatment is over wherein she underwent chemotherapy, radiation and Bone Marrow Transplant. She has been discharged and is at home now. She is on medication and regularly goes for check-up. The doctors have said she will take sometime to recover completely. We are all hopeful about her recovery. Please keep praying for her and supporting her. Thank you all, once again! Trust you are doing well. Thank you for the support. Parnavi went through one round of Chemotherapy initially after which she was fine. Around September she started with Radiation Therapy which was a difficult one. She faced a lot of side effects after going through the therapy like skin burns and infections. Hence, she started skin doctor's treatment and after recovering from the side effects, she went for the 2nd round of chemo. She is now going through Bone Marrow Transplant which requires total isolation. She has admitted to the hospital now and starting with her treatment in this week. Parnavi's mother has deposited Rs. 4Lac for this particular treatment and they still require 3Lac more for the treatment. We thank you for all the help and support you have shown Parnavi. Your blessings and prayers helped her in recovering faster. We would request you to share this campaign further with your friends and family. Will keep you posted.